DZero is designed to shed light on why the world around us is composed of normal matter and not its shadowy opposite: anti-matter. Researchers working on the experiment observed collisions of protons and anti-protons in the Tevatron. The collisions produced pairs of matter particles slightly more often than they yielded anti-matter particles. Physicists had already seen such differences - known as "CP violation", but these effects were small compared to those seen by the DZero experiment. The DZero results showed much more significant "asymmetry" of matter and anti-matter - beyond what could be explained by the Standard Model. 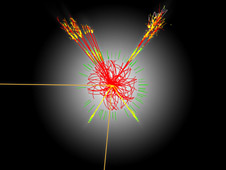 Bogdan Dobrescu, Adam Martin and Patrick J Fox from Fermilab say this large asymmetry effect can be accounted for by the existence of multiple Higgs bosons. They say the data points to five Higgs bosons with similar masses but different electric charges. Three would have a neutral charge and one each would have a negative and positive electric charge. This is known as the two-Higgs doublet model. Dr Martin told BBC News that the two-Higgs doublet could explain the results seen by the DZero team while keeping much of the Standard Model intact. "In models with an extra Higgs doublet, it's easy to have large new physics effects like this DZero result," he explained. "What's difficult is to have those large effects without damaging anything else that we have already measured." Dr Martin explained that there were other possible interpretations for the DZero result. 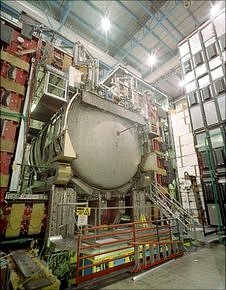 But he added: "The Standard Model fits just about every test we've thrown at it. To fit in a new effect in one particular place is not easy." Developed in the 1970s, the Standard Model incorporated all that was then known about the interactions of sub-atomic particles. But today, many physicists regard it as incomplete, a mere stepping stone to something else. The Standard Model cannot explain the best known of the so-called four fundamental forces: gravity; and it describes only ordinary matter, not the dark matter which makes up some 25% of the Universe. The Standard Model only has one Higgs "doublet". Although we tend to think of the Higgs boson as one particle, it actually comes in a package of four, explained Dr Martin. "In the Standard Model, you only see one of them because the other three are absorbed into [other parts of the scheme] such as the W and the Z bosons. There's only one left," he told BBC News. "So if you want to add another Higgs doublet - you actually have to add four more particles." The two-Higgs doublet model also ties in with a theory in particle physics known as supersymmetry. Supersymmetry represents an extension to the Standard Model, in which each particle in the scheme has a more massive "shadow" partner particle. But so far, physicists have lacked experimental evidence for the existence of these more massive particles. Evidence for the Higgs and for supersymmetry could be uncovered by the LHC, the world's most powerful "atom smasher" which is housed 100m under the French-Swiss border. The researchers have published the latest study on the pre-print server arXiv.org; the results were reported by Symmetry magazine. The three researchers are based at Fermilab but are not DZero team members.